Art Blakey’s Jazz Messengers were a major influential creative force in modern jazz for over three decades, with Blakey actively leading different incarnations of the band through to his death in 1990. They were legendary as representing the archetypal hard bop school of jazz, with a driving blues-flavoured approach. 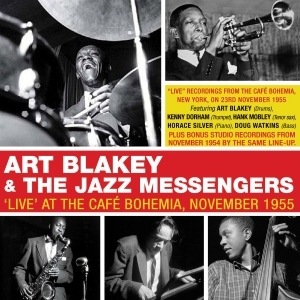 These performances came from early in the development of the Messengers soon after drummer Art Blakey and pianist Horace Silver had formed the group with tenor saxophonist Hank Mobley, trumpeter Kenny Dorham and bassist Doug Watkins, and these recordings were the first ‘live’ performances by this line-up to be recorded and released, and so represent something of a landmark. This set comprises the performances which were subsequently released on the Blue Note label. In addition, by way of a bonus, we also feature three studio tracks which this line-up had recorded at their first session together in November 1954, which were released by Blue Note as The Horace Silver Quintet. Including several extended performances where the full range of the group’s skill and style can be fully appreciated, this is a great showcase for one of the most admired ensembles in modern jazz, capturing the modern jazz zeitgeist of those years.